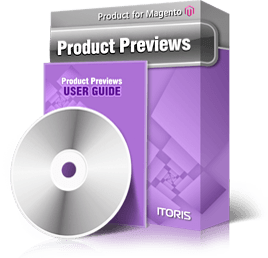 Product Previews module provides a quick view for products in catalog without directing to other pages - all the main details can be viewed in a DIV popup directly on the category view. When your customers browse your products and compare several ones - it can be timely to open each product page, then return back to the list, and so on. Your customers will see a special "Quick View" icon over product images on mouse hover. It opens up a modal window with the main product details - image(s), price, description, reviews as well as ability to add to cart, wishlist and compare list. For bundle, configurable, grouped products or the ones with custom options there is ability to configure products directly in the details’ window and still stay on the same page. Once the popup opened customer can navigate through products in the same category back and forth using the previous and next buttons.